I don't generally eat beef. I mean, if I accidentally order it or if I'm served it I will eat it but in general its not a regular part of my diet. I gave up eating beef about 3-4 years ago after reading about the environmental impact of cattle farming and not wanting to give up all meat decided that beef was an easy one for me to cut out. Perhaps its because it was never my favourite I seldom miss eating beef, especially since I've taken a strong liking to kangaroo as my bovine analogue of choice. For this trip I knew there were going to be times where beef would be on set menus or were integral parts of an authentic dish (as in Satay Perut), so I decided that I would partake in beef in those circumstances. 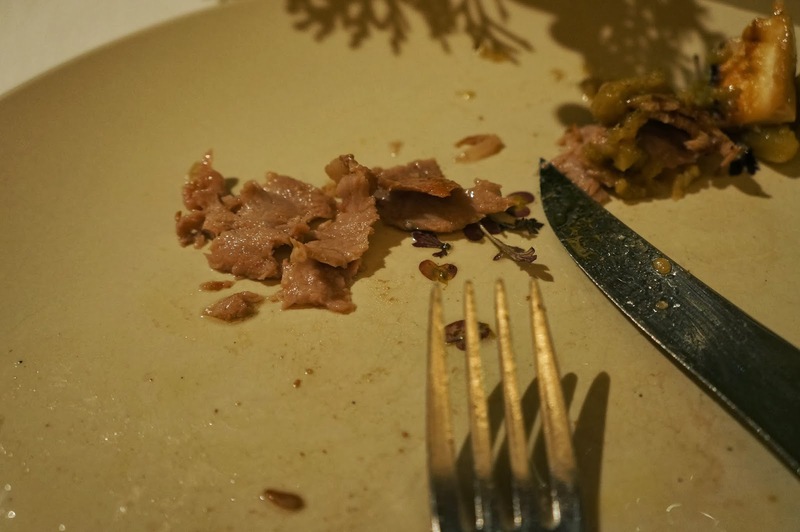 Why do I start with a long spiel about beef eating? Because if ever there was an argument that I should be eating beef, Iggy's definitely makes a strong case. Iggy's needs little introduction. Opened in 2004 by restaurateur Ignatius Chan and currently located within the Hilton Hotel on Orchard Rd, its been a staple 'of best' restaurant lists, three times being named the best restaurant in Asia by the Miele Guide and considered by many locals to be the best restaurant in the country. In 2012 it was voted #1 in all of Asia on the S. Pellegrino list, though falling to a still respectable #9 in 2013. I was definitely expecting big things, though Alissa had been slightly wary that the very modernist food might be a little too stuffy and intellectual for her liking. Reservations were easy enough to make online, though it should be noted that they do require a credit card number as no shows will be charged at the menu price for lunch or dinner. Concerned we might have blown all our money by this time, I'd decided to book the slightly cheaper lunch. Being a stickler for being on time and not wanting to be charged as no shows, we arrived at The Hilton earlier than required. The doors to the restaurant where closed with the Iggy's logo, a menu displaying today's tasting lunch and a button for the door located adjacent. 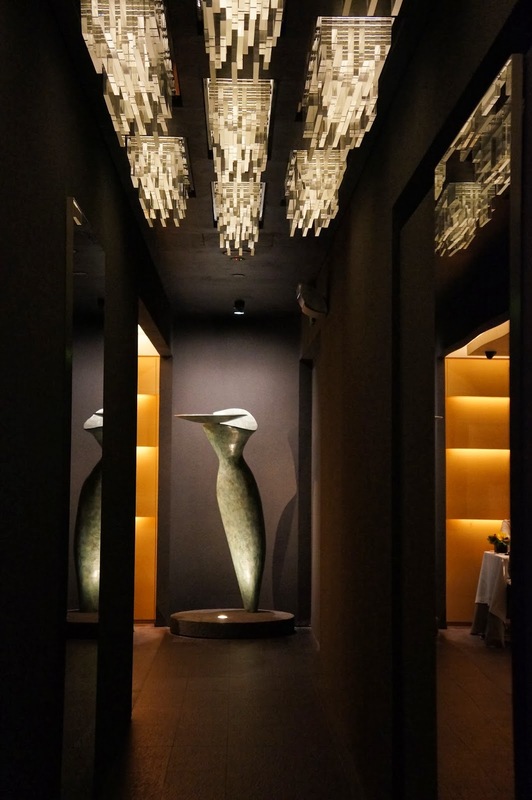 We pressed the button, informed them of our reservation and were guided down the ultra modern corridor to the dining room to the right of their premises. By this stage it had been a while since we'd done a tasting/degustation style meal, so we opted to go with the Tasting Lunch. 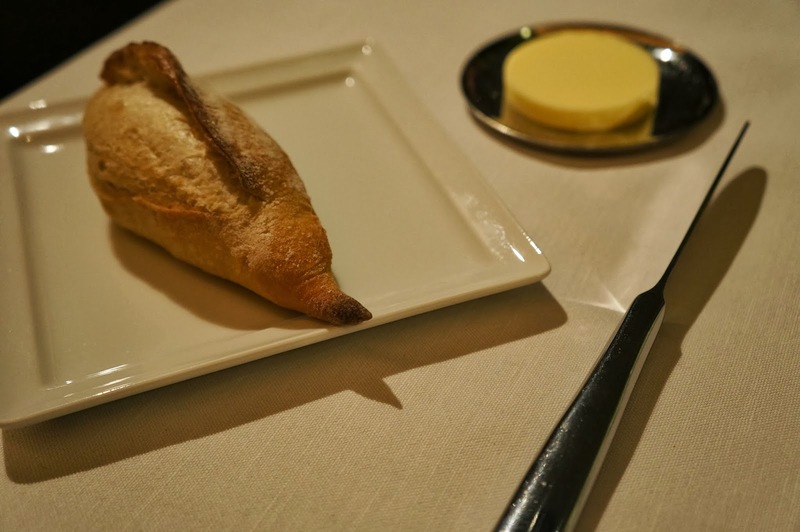 Based on the different menus I've seen posted online, this seems to change quite regularly and is based on what is seasonally available – which meant to my delight that white truffles were on the menu! To accompany our meal, I had a glass of the Riesling while Alissa went with a glass of Californian Zinfandel. 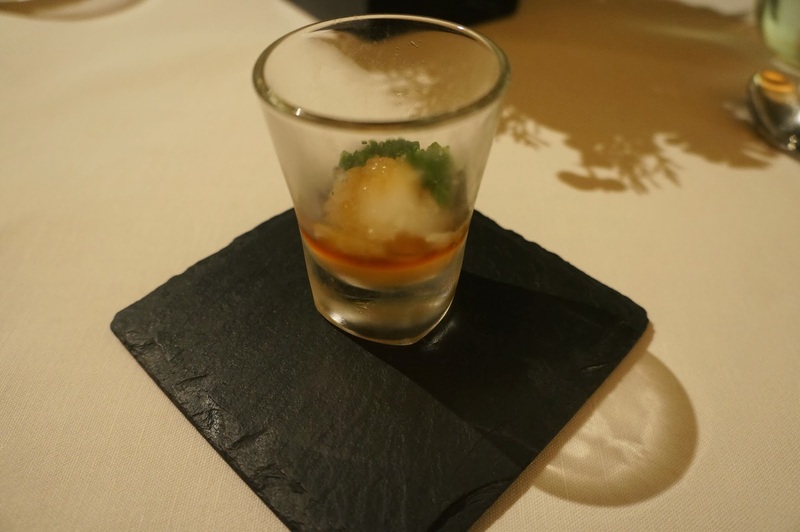 As is customary at a restaurant of this calibre, an Amuse Bouche came first – Monkfish Liver with Daikon and Ponzu sauce. Known as Ankimo in Japan and a delicacy considered the foie gras of the sea, this was my first time eating the dish and it was indeed delicious. Having the rich creaminess of foie gras, but lighter, silkier and undeniably marine in origin, it combined wonderfully with the daikon and the citrus of the ponzu sauce for a starter that followed the typically Japanese quality of being light and decadent at the same time. Next came the standard bread basket. Alissa and I went with the baguette. It was very good, though it was a step behind Otto e Mezzo Bombana and the benchmark-setting Caprice. At Iggy's the dishes are simply listed by their star ingredient, so when the Smoked Eel arrived in parfait form it was indeed a surprise. 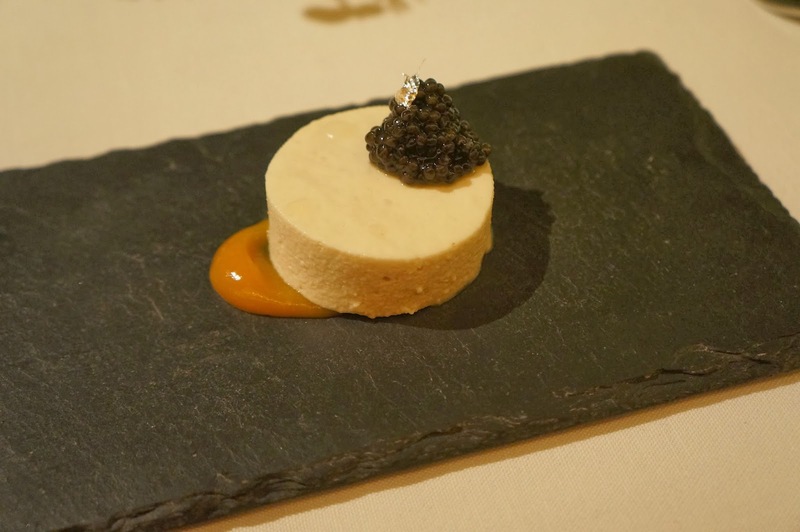 The dish had all the hallmarks of a convincing trompe l'oeil, with the caviar clumped in a manner that made it resemble a blackberry, the blood orange in a sauce that would not look out of place under a cake or ice cream, and the silver leaf a typical dessert touch. Tasting it however clearly revealed that this parfait was indeed smoked eel, and it was delicious in this form. This is the kind of intellectual dish Alissa had been worried about, however upon eating it she agreed that the cleverness of the dish did not take away from the most important thing – it tasted phenomenal. Tuna Belly came next, served grilled along the edges but rare in the middle and sitting in a puddle of menegi (Japanese spring onion) and egg that resembled melted chive-filled Paris de butter and topped with potato and wasabi. Though less surprising than the Smoked Eel, this was another wonderful dish. It reminded me of how tasty dipping steamboat meats in raw egg can be, but all the more tasty due to the use of tuna and the subtle vapour heat of the wasabi. Again, very impressive. December is a good time to travel if you're a foodie, especially considering Alba White Truffle was on the menu as our next course. This simple dish of tagliarini, poultry jus and Parmigiano Reggiano may not have been as generously topped with white truffle as my meal at Otto e Mezzo Bombana, but the fact this was a more simple dish meant the truffle nevertheless got to shine brightly as the star – plus the one raviolo at Otto e Mezzo cost almost as much as my entire tasting lunch at Iggy's! 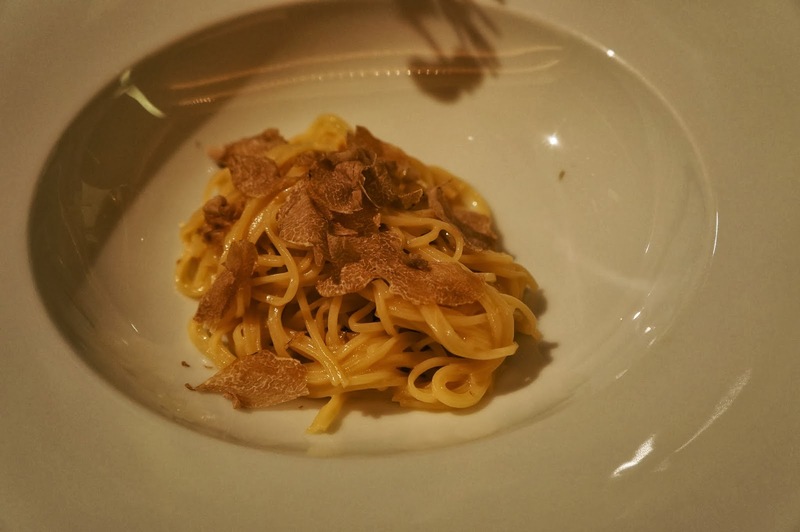 The first time trying the white truffle at Otto e Mezzo was about familiarising myself with what to expect from the dish, and in that light perhaps I should have gone with the similar simple pasta dish on Otto e Mezzo's truffle menu. Tasting it again here elevating a cheese and chicken jus pasta, I think I can say I'm definitely falling in love with white truffle as an ingredient and its really to the credit of the chef that the white truffle was presented in so restrained a context. In spite of how good everything else had been up to this point the star of the meal was the Joshu Beef, served with Nasu (eggplant), baby carrots, mushroom and garlic oil. 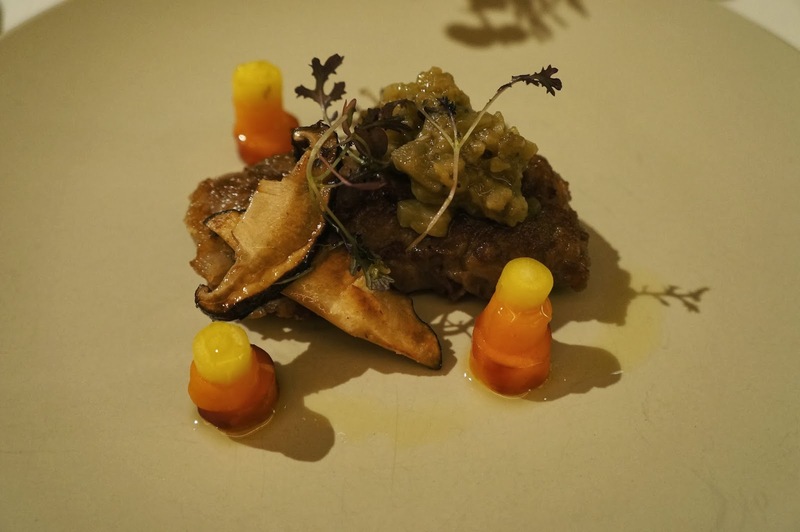 The plating was beautiful, in particular the way the carrots were sliced and placed blending down from yellow to orange to red. All the accompanying vegetables were cooked expertly, but the beef was just amazing. What looked like a single fillet of meat was actually layers of thinly sliced beef, similar to the kind you'd find in shabu shabu or steamboat. I've always thought this was an exquisitely tender way of preparing beef or pork, so been served a 'steak' made up of these thin slices was a revelation. Combined with the wonderful garlic oil, eggplant an carrot, this was moist, juicy and flavoursome, with none of the dryness and tough chewiness I dislike in this meat. I'd go as far as to say this was best cooked beef dish I've ever eaten. And as someone who is never really excited about beef to be this impressed, it really means something. 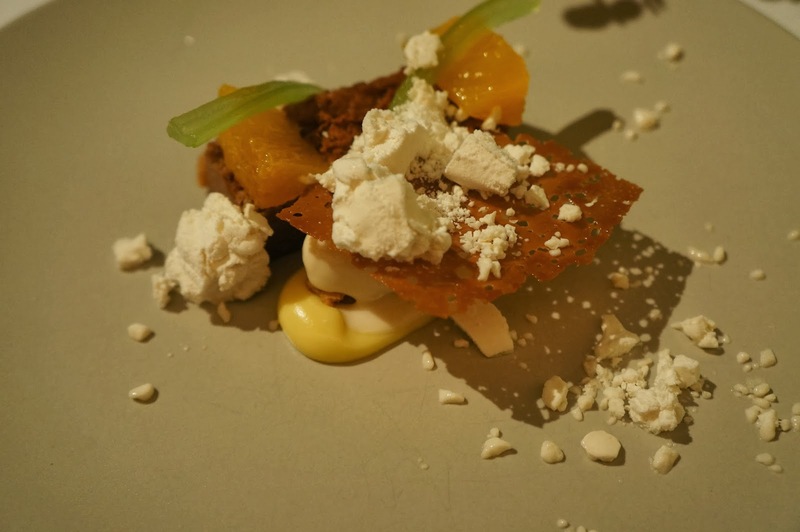 One of my least favourite ingredients was included in the Peanut dessert course – celery. Additionally served with orange slices, a flourless cake and very thin sheet of peanut brittle, the dessert came out to us with a peanut butter cream having just been set in liquid nitrogen based on the slight dry ice-like fog that was still coming off the plates as it was presented to us. This was another truly top class dish, with all the flavours working together wonderfully – even my old enemy of celery, here presented in a proportion that didn't override any of the other flavours. I particularly liked the peanut brittle sheet and the flourless cake, especially if on the same spoon as a piece of the peanut butter ice cream. This was so good I even ate all the celery. We decided to go with a cup of coffee at the end of our meal in spite of it being a little pricey, as I had to know if they would get this right too. What we were presented with was easily the best coffee of our entire trip. 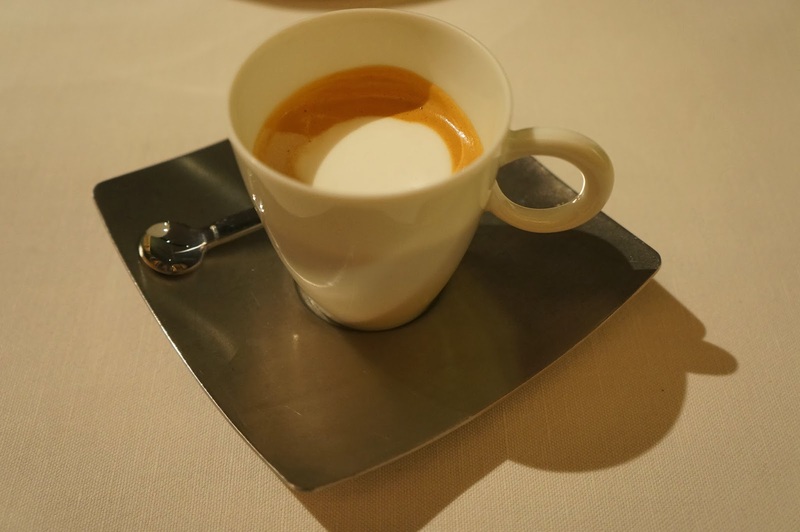 We've had some really overly hot coffees throughout our time in Asia, along with very bitter and stupidly giant cups too, so it was nice to receive a cup that obviously used good quality beans and was served to us at a drinkable temperature. I should add that service at Iggy's was of the highest level of quality. Alissa and I particularly found Rita, the manager who served us for most of the meal, to be very friendly and informative. 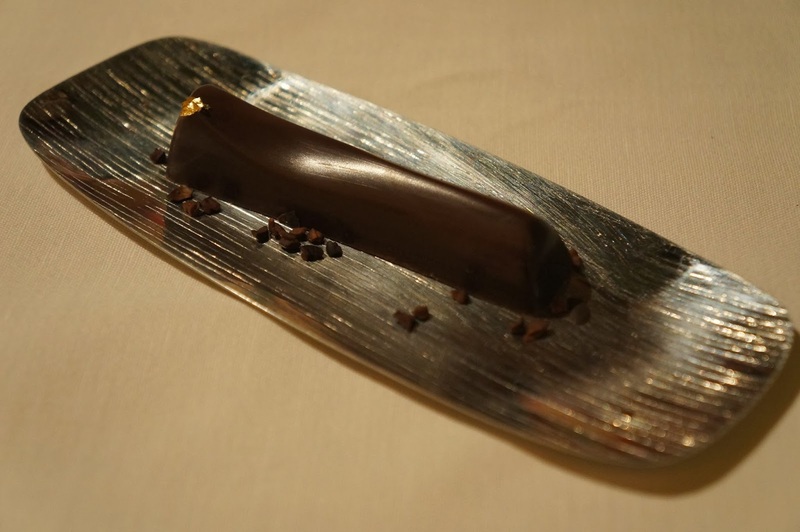 When she brought out the long piece of chocolate that would serve as our petit four, she added that this was for us to share as symbolic of our married lives together. The chocolate was very good, with a nice smooth soft filling. It was on the same level as the chocolates at Caprice, and a lovely way to finish a memorable lunch. Alissa had been skeptical about Iggy's, but by the end of the meal she was a convert. Iggy's was definitely the real deal – definitely deserving of its accolades and the esteem its held in. 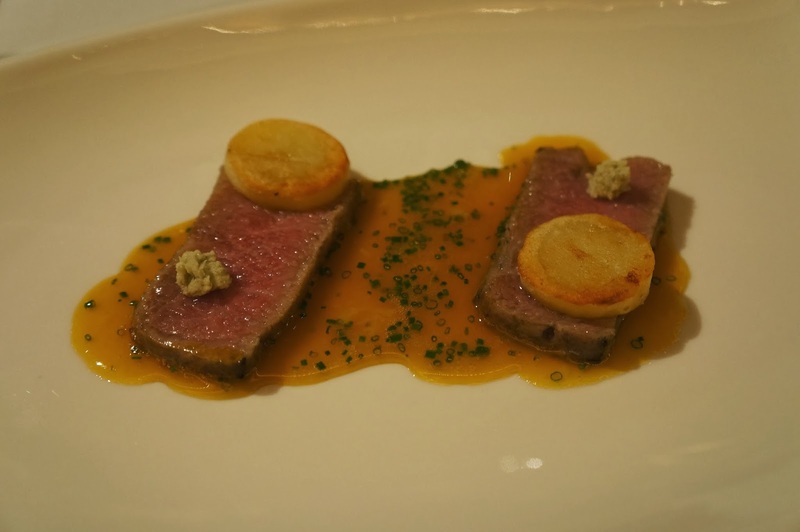 This was probably the best of the modernist fine dining restaurants we'd dined at during our trip and the closest we came to the quality of Caprice. 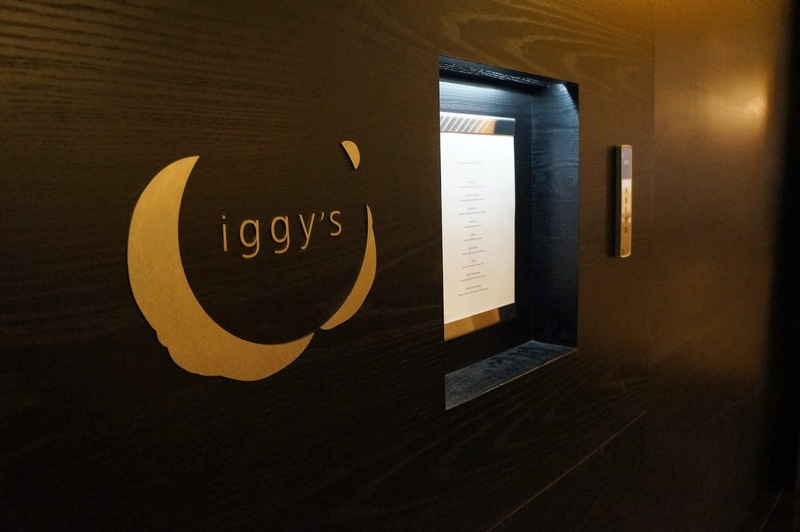 Compared to Indigo, which had a similar fusion of Asian and Western flavours, Iggy's was much more refined and better executed, with a stronger sense of character and identity that would make me want to come back. Even if it was the second most expensive lunch we'd had during the entire trip – eclipsed in price only by the lesser Otto e Mezzo Bombana - it was very much worth it.